Despite it’s growing popularity in recent years, not many people know how to get to Havasu Falls. Havasu Falls sits on the Havasupai Reservation within the Havasu Canyon – in Supai, Arizona. If you’re flying in from out of state, you’ll want to fly into the airports of either Phoenix or Las Vegas. Each are about a four and a half hour drive to the trailhead, which begins at the Hualapai Hilltop. In order to save up their strength for a long day of hiking, many people choose to stay overnight near the trailhead. The closest towns are Seligman and Peach Springs. The Grand Canyon Caverns Inn is the closest place to lodge prior to hiking to Havasu. Also, be sure to fuel up in Peach Springs or Seligman because those cities are about 70 miles and 90 miles from Hualapai Hilltop, respectively, and once at Hualapai Hilltop you won’t have any options for refueling…. The tribe sells gas by 5 gallon jugs for roughly $10/gallon, but leave that as an emergency plan. Once you reach the Hualapai Hilltop parking lot, you’ve got a moderate 10-mile hike ahead of you to get to Havasu Falls. The most strenuous part of the hike is the first mile and a half of switchbacks, which traverse down the face of the canyon wall. 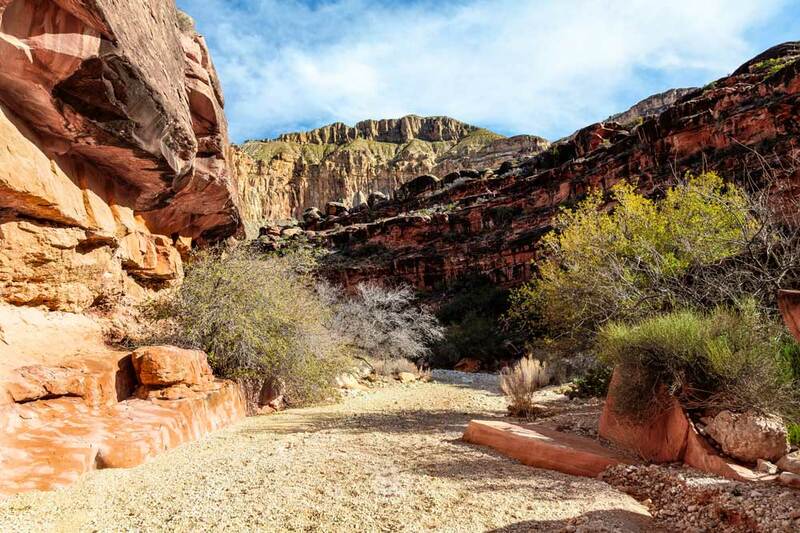 The remainder of the hike is lined by the gorgeous red ribbon-striped rock and footed with desert trails, sandy washes, boulders and streams. The path is very heavily traveled so trails are apparent, but if you’d like extra assurance you can find hiking directions by searching Google Maps for walking options from Hualapai Hilltop to Havasupai Tourist Enterprise. At the 8-mile mark, you’ll reach the Supai village. You should stop at the village to rest the feet, stretch the legs and visit the restaurant to buy Indian Fry Bread – you won’t regret it! Within the village, you will see signs marking how to get to Havasu Falls and to camp. You’ll continue the final two miles to Havasu in deep red sand. Along the way, you’ll cross a foot bridge and walk past two of the first falls: Fifty-foot Falls and Navajo Falls – Also, if your adventurous, you might be able to see Hidden Falls. As you start to wonder where this path is truly taking you, you’ll notice a slight descent in the trail. The vegetation dissipates and the curvy path seems to disappear behind a mountain wall. The steady crash of falling water will tell you that you’re not far off! As you turn the corner, you’ll catch your first glimpse of Havasu Falls in all it’s glory! The trail becomes a staircase composed of rock and logs. You’ll have to stop and admire the falls periodically along the way to keep stumbling down the hill! The trail will continue on to the campground, but to get to Havasu Falls, you’ll make a sharp right down a lightly-treaded dirt path. The trail drops suddenly into the most gorgeous oasis you’ll ever see – Havasu Falls! It’s everything you’ve seen pictured and more! If you’re still asking yourself – “How to get to Havasu Falls?” –BG Wild has the answer! Making this trip a reality can be difficult. To visit the falls you must purchase a permit and camping reservation – no day hikes allowed. Depending on how you choose to book your reservations, obtaining hiking permits can be almost impossible! Then you will have to plan the logistics, gear, hiking and further communication with the tribe. We can GUARANTEE you a reservation! The tribe designates a small portion of their reservations each year for outfitters. This means that even after individual spots have sold out in February, our spots remain locked in. We take care of your permits, reservations and communication with the tribe so there’s no hassle or headaches for you! Our food is incredible! Since we’re able to helicopter our gear down to the village, we can provide a pretty extraordinary spread! No freeze dried meals, spaghetti and oatmeal here. We’re talking steak, salmon, shrimp, ravioli, scrambled eggs, bacon, pancakes, and more! We offer massages and yoga. Yup! You read that right! We bring along professional massage therapists and yoga instructors on our Luxury trips. Because, why not? Our team of first responders, EMTs, Firefighters and CPR pros are not only skilled in outdoor survival, but they are also hands down the most fun, inviting and goofy people you will meet. 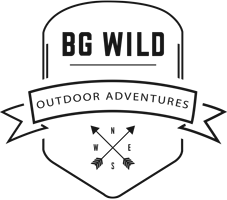 There’s no better way to tour the canyon’s many trails, waterfalls, caves, grottos and cliffs than with BG Wild. We guarantee you’ll love them! This year we have three different trip types to choose from: Traditional, Comfort, and Luxury. Whatever your adventure style and budget, we have you covered! Come to Havasu Falls with us!